today’s technically the last day of fall. and while most people have moved on from pumpkins and pumpkin flavored things because it feels like winter and psl’s haven’t been available at sbucks since early november, i’m here to squeeze in one last pumpkin spice recipe. i’m calling them pumpkin spice, but they’re more that that; these waffles have both pumpkin spice (i used spices typically used in pumpkin spice, though a pre-mixed version is fine too) and pumpkin (okay, mine had a mix of kabocha and delicata squashes, but you can use pumpkin + mine tasted like pumpkin anyways). these pumpkin spice waffles are lightly spiced, with a hint of squash. if i didn’t know it was kabocha/delicata squash, i would have thought it was pumpkin. you can’t even taste the white whole wheat flour, and could probably increase it if you wanted. these waffles are tender and delicate and they soften even if you let them cool on a wire rack; if you want the crispy edges back (oh why did you have to go), toast the waffle for a bit and it crunchifies again. what follows is a couple of serving suggestions. first up: yogurt, orange zest and supremes, and shaved chocolate.the cold yogurt provides a creamy, tangy counterpoint to the hot waffle. though if you just want creamy and no tangy (ice cream or whipped cream), i fully support you in your endeavors. making orange supremes isn’t hard, but it is a little more annoying, and you can always hand peel the segments instead. 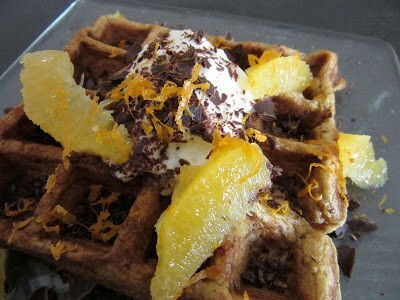 either way, you get juicy, sweet/tart orange deliciousness soaking into your waffle. the orange zest adds even more fragrance plus an amazing color, though i totally understand if you’re not into it (my mom is staunchly anti- orange zest). and as if the mere presence of chocolate isn’t great enough, there’s alternating pockets of solid and molten bits of chocolate. onto the savory. 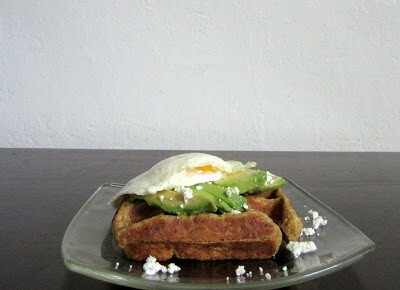 this little pumpkin spice waffle was topped with sliced avocado, a runny fried egg and crumbled feta. it might sound a bit rich, since there was 3 kinds of creamy, but it was really tasty. if you imagine the waffle as being predominantly pumpkin/squash rather than pumpkin spice, the pairing sounds less out there. the waffle’s gentle vegetal sweetness (stick with me!) and the toppings were heightened by each other, and it’s a great breakfast/lunch/snack/breakfast for dinner. or maybe you’re trying to tbt (throwback to thanksgiving), in which case this waffle with cheddar melted on and topped with sliced deli chicken and cranberry sauce is perfect. the waffle is more hidden flavorwise by the toppings compared to the avo/egg combo, but it’s still delicious. These pumpkin spice waffles are super versatile, and are delicious plain, sweet or savory. In one bowl whisk the dry ingredients. In a large bowl, whisk the wet ingredients. Don't worry if it's not totally smooth; I had bits of mashed squash and part of the coconut cream from the top of the can still floating around, and it was fine. Stir in the dry ingredients just until combined. Cook the waffles in a hot greased waffle iron until the waffles are browned and crispy on the outside. At about this time, my waffle iron stops sizzling, and there isn’t as much steam rising from it (your iron may be different, so check the manufacturer’s instructions). I used about 3/8 cup batter per waffle, and ended up with 13. 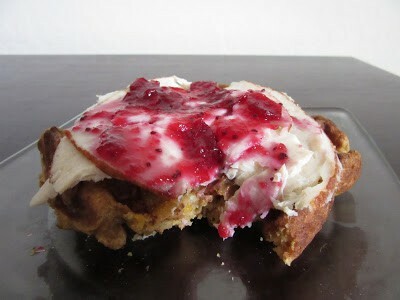 Serve these pumpkin spice waffles with your choice of topping: maple syrup and pecans, avocado and a fried egg, chorizo and spinach, fried chicken and maple syrup, sliced deli chicken/turkey with cranberries and cheddar, yogurt/ice cream with shaved chocolate and orange segments + zest, you name it! Adapted slightly from fiveandspice via Food52. You can really use whatever squash you want in your waffles! Delicata and kabocha are both tasty in these. 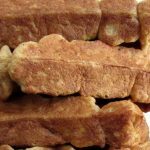 I love waffles and I am happy to see this delightful recipe! Well done! waffles are soooo good (: team waffles > pancakes!